(Beyond Pesticides, January 24, 2019) A UK Study has concluded that the expansion of community gardens, identified as “pollinator hotspots” with “high pollinator diversity,” offer an important opportunity for assisting ailing pollinator species and improving community quality of life, particularly in low income neighborhoods. Consequently, researchers suggest towns and cities can be planned and managed more effectively to steward existing urban biodiversity to create essential havens for pollinators and people under stress. As previous research has shown that organic agriculture boosts local economies, researchers account for and compare a key socioeconomic factor; household income. Affluent neighborhoods have larger, more numerous, and more consistently maintained gardens and green spaces. To increase city-scale robustness, researchers suggest increasing community garden allotments, planting perennial flowering plants in cemeteries, and improving management of public parks. However, researchers explain that increasing the number of community gardens, particularly in communities of low-income, would be the best strategy per unit area, as it would expand viable habitat for pollinators throughout cities while providing much-needed green space and food sources for people. To identify conservation opportunities, the study examined all major land uses and their impact on floral availability in the cities Bristol, Edinburgh, Leeds and Reading in the United Kingdom (UK). The nine major land use categories selected for sampling, include: (1) allotments (community gardens); (2) cemeteries; (3) residential gardens; (4) man-made impermeable surfaces; (5) urban nature reserves; (6) other green spaces (including school playing fields and yards); (7) public parks; (8) pavements; and (9) road verges (plant strips in-between roadways and sidewalks). For each city, ten sampling sites were chosen randomly. Every site was sampled three times between April and September of 2012 and 2013. Results correlate floral abundance with pollinator abundance. Bees, hoverflies and non-syrphid Diptera (such as the common fly), represent 90% of flower visitors. For all four cities, residential and community gardens contain 54–83% of pollinators. Unsurprisingly, plant species commonly called “weeds” were shown to be critical for pollinator survival as they provide a varied array of nutrient resources. Overall, Dandelion (Taraxacum), were visited most often, and common daisy least often. Other pollinator favorites are Creeping buttercup: Ranunculus repens, Hogweed, or cow parsnip (Heracleum sphondylium), and a perennial species, Creeping Thistle (Cirsium arvense). In all four cities, residential gardens at houses with higher median income showed higher floral abundance, along with higher numbers of pollinators present. The influence of socioeconomic factors in constraining pollinator conservation cannot be discounted. Especially with climate change bringing stronger storms and heavy rains, building communities resilient to storm surges and food shortages can be the only measure of success. In this way, urban planning for sustainability will necessitate the expansion of community gardens and robust local food systems. Take Action: In light of the shortcomings of federal action and industry groups working to weaken and derail any pesticide reforms at state and local levels, gardeners have an important role to play in pollinator conservation, quality of life, and availability of local organic food community-wide across all income groups. Organize with community leaders and arrange meetings with city officials to discuss expanding garden resources and training programs, such as arranging planting demonstrations. 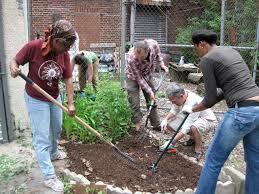 For parks, advocate for organic land management with city officials. One simple strategy; reduced mowing, comes with immediate cost-savings, and with it, increased floral abundance for urban pollinators in distress. What more can you do? For comprehensive protection, ensure new pollinator habitat be kept pesticide-free, as designated pollinator habitat areas can still put pollinators at risk if pesticides are used. Before you mow, consider allowing flowering plants, like clover and dandelions to bloom. Consider turning your yard into an organic, low-maintenance garden, or let a portion of your property re-wild altogether. Preserve biodiversity as if life depends on it. For more information and guidelines to get you started, read “Hedgerows for Biodiversity” by Terry Shistar, Ph.D. You can also visit “Managing Landscapes with Pollinators in Mind” for help deciding which plants are right for your region and the type of pollinators you want to attract. This entry was posted on Thursday, January 24th, 2019 at 12:00 am	and is filed under Agriculture, Alternatives/Organics, Beneficials, Biodiversity, Climate Change, Environmental Justice, Habitat Protection, International, Lawns/Landscapes, Pollinators, Uncategorized. You can follow any responses to this entry through the RSS 2.0 feed. You can skip to the end and leave a response. Pinging is currently not allowed.